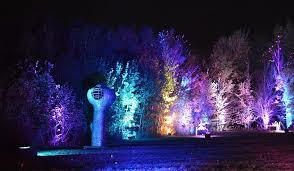 EAST OTTO, N.Y. -- The Night Lights display at Griffis Sculpture Park is now CLOSED for the season. The sculpture park took another hit of rain yesterday, essentially knocking out our parking lot (too soft and muddy) and rendering two parts of the trail impassible. For the safety of all involved – and not getting their cars stuck in the mud – we have to close Friday and Saturday, thus ending this year's edition of Night Lights at Griffis Sculpture Park. It's a slightly sad ending, to an otherwise wonderful month at the sculpture park. We had our big crowds and everyone was amazing. Night Lights is already planning bigger and better things for 2019, so we look forward to their return next year. We love you all and send out a big hug.